Following their return from Serbia at the end of 2015, Jan and Cora Gordon wrote newspaper articles and their first book, "The Luck of Thirteen" (to positive reviews) and also exhibited sketches from their adventure. 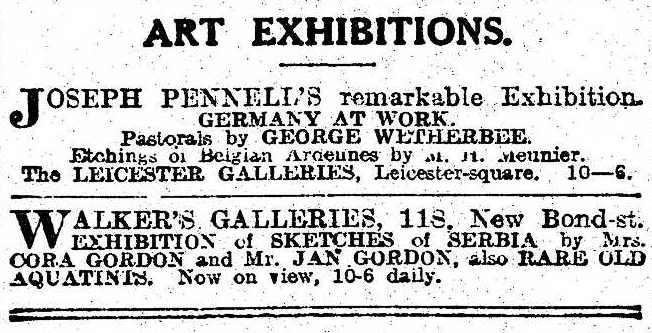 "The Standard" of March 13th 1916 (late morning edition, which cost one penny) contains a note about an exhibition of such sketches at Walker's Galleries, 118 New Bond-st., London. 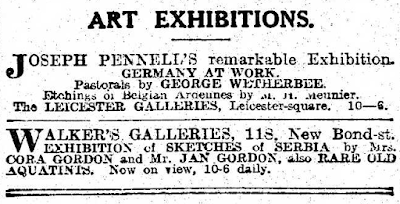 One of the sketches had been worked up by Frédéric de Haenen into a full spread illustration in the Illustrated London News of December 25th 2015.